Ten Thousand Thing's Doubt was number two on my list of shows to see this year. After seeing my first show last year (My Fair Lady, one of my 2010 top 10), I was hooked on TTT's bare-bones style of theater that cuts right to the core of the matter, without interference from the elaborate sets or luscious costumes or dramatic lighting you so often see in the theater these days. The short but intense four-person play Doubt, A Parable was the perfect choice for this kind of theater. I had never seen the play on stage before but I did see the 2008 movie starring Meryl Streep and Phillip Seymour Hoffman so I was familiar with the plot and themes. The plot is fairly straight-forward: a nun and principal of a Catholic School in 1964 accuses a priest of molesting a student. But everything that happens around that is anything but straight-forward. I was left at the end of the play not knowing who to believe. And that's really what the play is about. In a note from playwright John Patrick Shanley, he says, "You may come out of my play uncertain. You may want to be sure. Look down on that feeling. We've got to learn to live with a full measure of uncertainty. There is no last word." Ten Thousand Things always attracts top-notch talent, and Doubt is no exception. The play is directed by Peter Rothstein of Theater Latte Da and stars Sally Wingert (the Meryl Streep of the Minneapolis/St. Paul theater scene) as the stern and traditional Sister Aloysius, Kris Nelson as the charismatic and progressive Father Flynn, Jane Froiland as the young naive Sister James, and Regina Marie Williams in the short but pivotal role of Mrs. Muller, the boy's mother. They were all brilliant in their roles, and it's a truly remarkable thing to be that close to them in a bright room and watch these masters of their craft. So much happens in the short 75 minute run time that it leaves your head spinning. What I found most fascinating was the strict hierarchy of the Catholic Church and the power struggles between the men and women in the institution. Sister Aloysius is limited in what she can do about the situation she believes is occurring and has to follow a strict order of reporting her suspicions, which often leads to a dead end. I think she truly does believe Father Flynn is guilty, but she's also using the accusation as a power play. Sister James wants to believe the best about people, and because Father Flynn is kind to her, she believes he's telling the truth. This is likely not the first time Father Flynn has been accused, and although he's devastated to leave his parishoners, he knows how to work the male-dominated system so that he moves on to another parish in what amounts to a promotion. Another issue that the play deals with is racism. The boy who is the (alleged?) victim is the only African American in an all-white school in the early 1960s. We find out from his mother that he needs to make it through June and complete the 8th grade so that he can get into a good high school and make something of his life. In the absence of any concrete evidence, Mrs. Muller is willing to let things continue as is for just a few more months, believing in the end it's the best opportunity she can give her son. 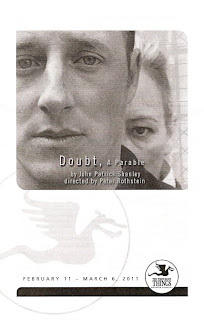 The full title of the play is Doubt, A Parable, which I found to be an interesting choice. At one point Sister James asks Father Flynn about a story he told in his homily. He told her that it was something he made up to illustrate a point - a parable. She asked him if it wouldn't be better to talk about a true story. He said no, the truth is too complicated and messy. And it certainly is in this story. If you're interested in learning more about Ten Thousand Things and their mission to "bring lively, intelligent theater to people with little access to the wealth of the arts," watch this short piece from Minnesota Originals. You'll get to go with TTT into a prison, hear from some of their non-traditional audience members, and learn about the origins of the theater from Artistic Director and Founder Michelle Hensley. Or you can attend their next show - the musical Man of La Mancha. I guarantee you've never seen theater like this.